It was love at first sight. Or perhaps it’s more fitting to say at first taste. I remember the first time I tasted matcha. I just graduated from middle school, and my parents and I ate out after the ceremonies at a nice Japanese restaurant. We had teppanyaki and tempura, I think. But what really marked that meal was the dessert. Matcha green tea ice cream. It was just another world. I savoured every bit of it, trying really hard to construct that flavour in my head, to sort of stamp it in my memory. I needed to keep that taste, and I never really forgot. As a 13-year old girl, my world was just blown away. The thing is, Matcha is quite expensive and not yet readily available to everyone back then in Manila. One had to dine at a fancy Japanese resto to have it, and for a teenager, that just wasn’t an option. Years later and a continent farther, green tea, and Matcha particularly, has become more accessible and more well known even to the non-Japanese palette. Here in Switzerland, a lot of tea houses and Japanese markets have sprouted offering a variety of Japanese (and Korean) goods. I was glad to see that Matcha powder was available and with a range of different ones to choose from. Suffice to say, it is still quite pricey, but not as much as 3 years ago when a very small bag (150 grams) would cost 50 precious Swiss francs. So now, we do make sure having it constantly in our little tea nook. One of our good friends brought us back a pack from Japan which we have absolutely adored and put to good use (matcha lattés and green tea pound cakes, yummmm!). 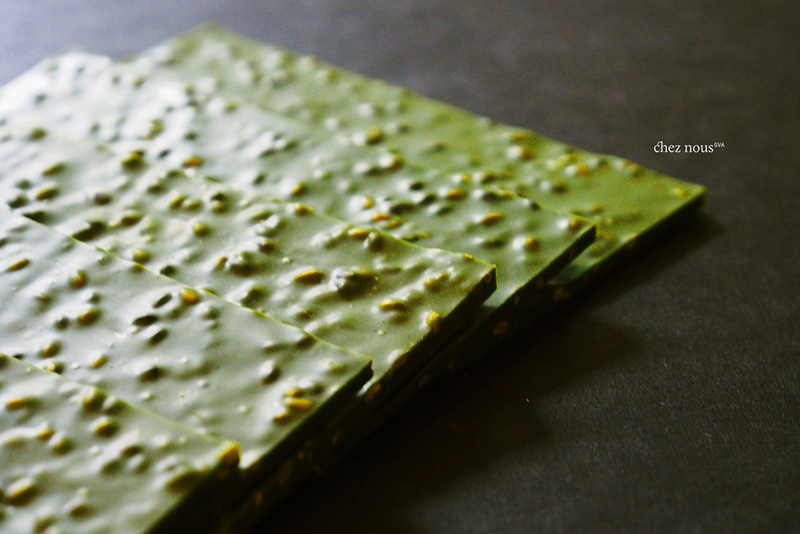 She also gave us these exquisite matcha sesame chocolate bars from Paris during the holidays. 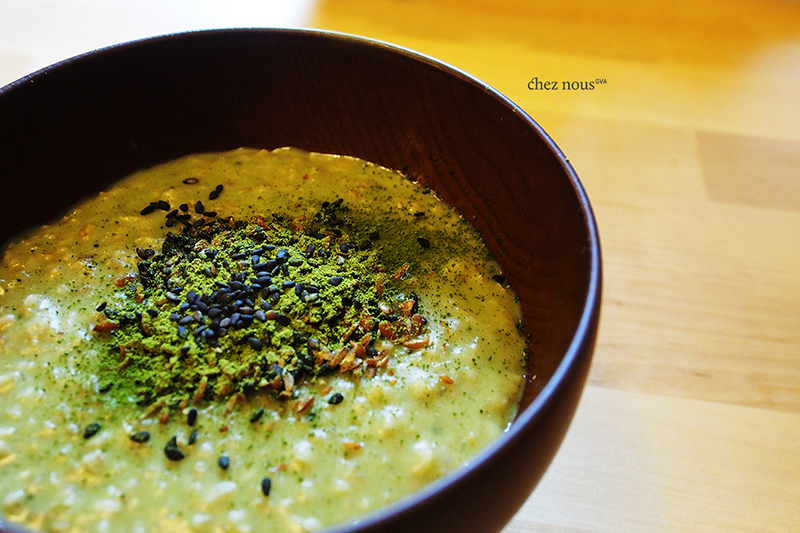 For breakfast, we cooked up this gorgeous Matcha oatmeal porridge. Healthy. Delicious. And no-fuss. Combine oats, salt, milk and water in a casserole. Bring to a boil, and simmer for 20 minutes, stirring regularly. Add a little water when it starts to dry up. 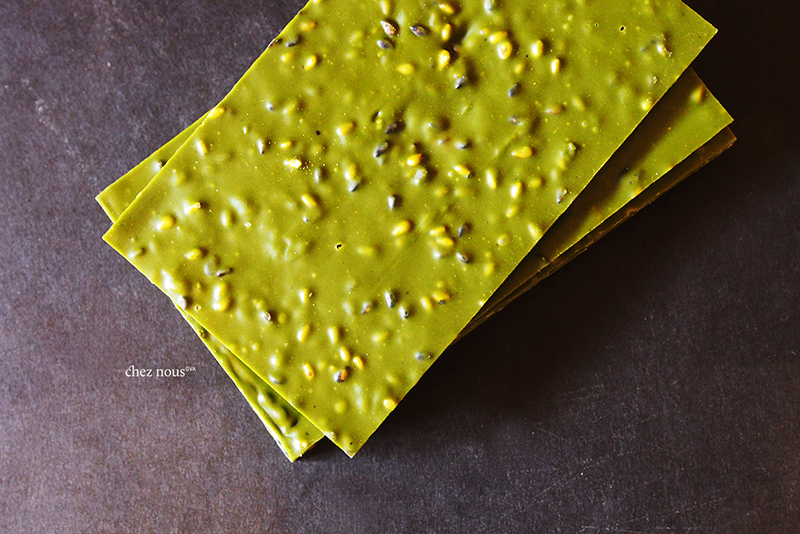 In the last 5 minutes, add in the honey and the matcha. 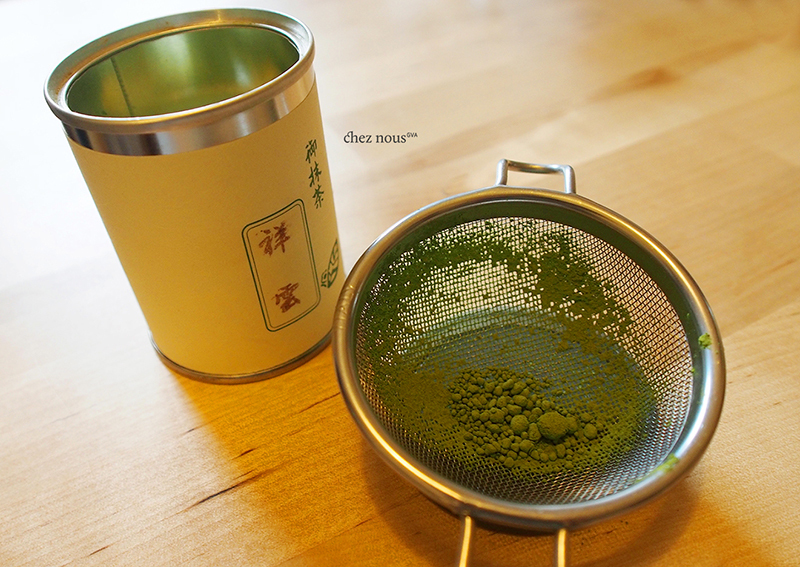 Mix well to avoid the matcha from lumping. 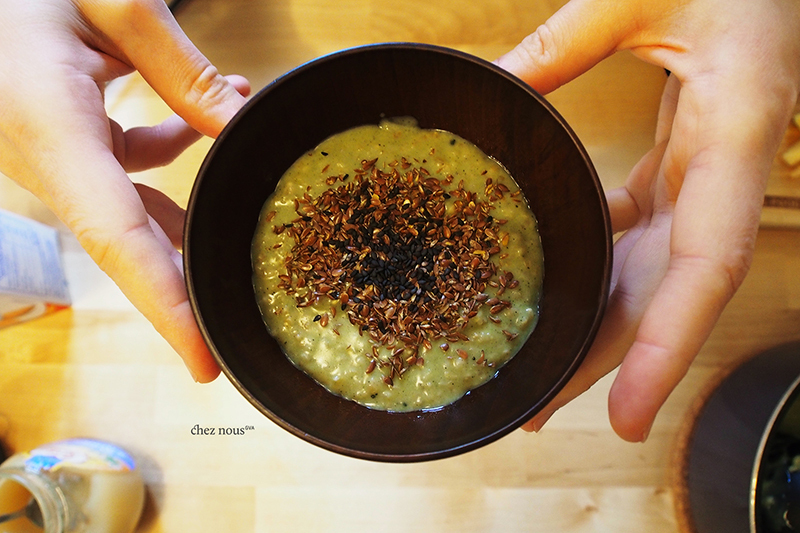 Pour into bowls, dust with a bit more matcha and sprinkle with black sesame seeds and flaxseeds.